Princess Salimah Aga Khan, SOS International Ambassador for the Children, toured cities across Canada in support of SOS Children’s Villages this past October. Princess Salimah Aga Khan’s visit to Canada began in Toronto with two events to support the Green Family SOS Children’s Village Ondangwa in Namibia and SOS' work with children and families in need. These events were attended by long-time supporters of SOS and introduced new people to our cause. 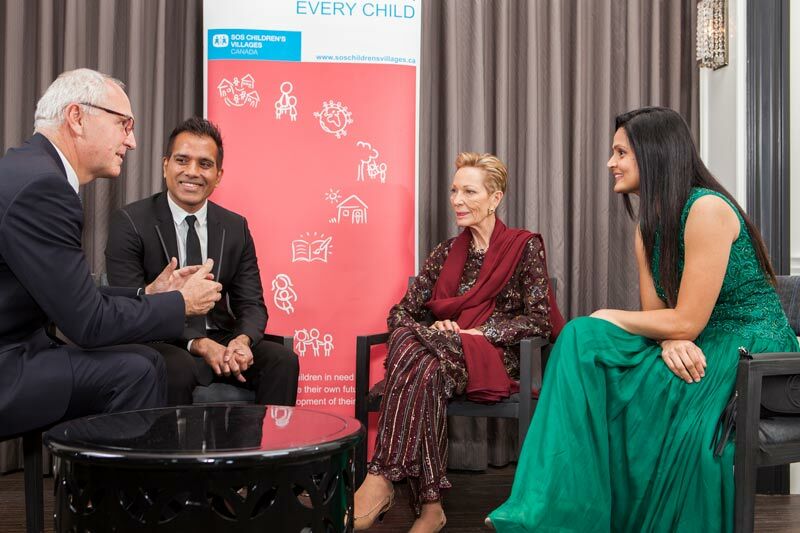 Hosted by Zeena and Farid Amarshi, the SOS Ambassadors for Education dinner was an intimate event in support of the Gunjula Early Child Development project in Uganda and SOS Children’s Villages’ work with vulnerable children around the world. The Amarshi family was first introduced to SOS at the 2017 Marigold Gala, where Princess Salimah was the guest of honour. Since then, the Amarshi family and their company, Victoria Village Group, have become champions for our work. The Gunjula project is a partnership between SOS Children’s Villages, Victoria Village Group and the Amarshi family that aims to improve access to quality early child development (ECD) programs for disadvantaged children in Uganda. The project is providing teacher training, improving community ECD centres, providing new learning materials and play equipment, and advocating for greater access to quality ECD services in Uganda. At the dinner, the Princess shared her passion for the work of SOS Children’s Villages with guests and received each couple in attendance in a private audience.Special thanks go to Wahid and Sarah Amarshi, together with the Victoria Village Group Board of Directors, whose special efforts made this a truly memorable evening. Thanks to the generosity of the Amarshi family and Victoria Village Group, who covered the costs of the event, $90,000 was raised to support the Gunjula project and the work of SOS Children’s Villages around the world. The Beyond All Limits Gala in Calgary was attended by 350 people in support of the SOS Ugandan Girls’ Education Project. The SOS Ugandan Girls’ Education Project helps to ensure that girls from the most marginalized communities, who are often denied the chance to go to school, can access an education. The project will help to increase school access, attendance, retention and completion for approximately 2,000 girls living in disadvantaged communities in Uganda. Richard Pichler, a SOS Special Representative who grew up in a SOS Village, spoke to the meaning behind the gala’s theme and SOS’ approach during his speech: there are no limits to what a child can achieve when they receive the love, care and support they need to thrive. Thanks to our presenting sponsor, the Western Investment Company of Canada, and the gala’s table sponsors, we were able to ensure that more girls in Uganda get the education they want and deserve. A special thank you also goes to the Calgary planning committee, including Senator Scott Tannas, Shafeen Mawani, Kirstin Danielson and Saqib Tariq, whose work and dedication made the event possible. The gala was a great success thanks to everyone involved, with Princess Salimah helping to introduce SOS to the Ismaili community in Calgary and laying the groundwork for a long-term and rewarding relationship. Princess Salimah’s tour ended with a visit to SOS Children’s Village British Columbia and a gala event in Vancouver to honour SOS caregivers. We want to extend our thanks to everyone who attended, planned and supported the Princess Salimah events across Canada in support of SOS Children’s Villages. A heartfelt thank you goes to Princess Salimah Aga Khan for sharing her time and enthusiasm for the work of SOS Children’s Villages with communities across Canada. We look forward to next year’s visit from Princess Salimah Aga Khan as we celebrate the 50th anniversary of SOS Children’s Villages Canada.